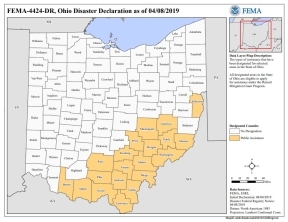 COLUMBUS-State Senator Bob Peterson (R-Washington Court House) today announced that 20 southern Ohio counties that were impacted by severe storms, flooding and resulting landslides earlier this year are now eligible for federal funding after a Presidential Disaster Declaration on April 8, 2019. 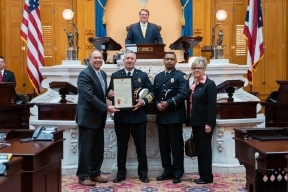 COLUMBUS-State Senator Bob Peterson (R-Washington Court House) on Wednesday recognized the 140th anniversary of the Chillicothe Fire Department. 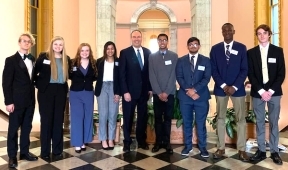 COLUMBUS-State Senator Bob Peterson (R-Washington Court House) yesterday voted in favor of releasing a $1,070,680 capital appropriation for the Ohio University Chillicothe (OUC) Academic Success Center Stevenson Renovation project. In total, the project will be a $1.7 million investment from a combination of state dollars, local funds and charitable gifts. 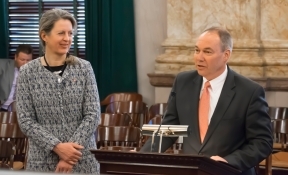 COLUMBUS-State Senator Bob Peterson (R-Washington Court House) recently announced that Lawrence, Pickaway and Ross counties will receive funding from the Ohio Department of Natural Resources to support local marine patrol units. Provided by the ODNR Division of Parks and Watercraft, these assistance funds represent a continuing effort to keep Ohio waterways safe and enhance recreational boating experiences. COLUMBUS-State Senator Bob Peterson (R-Washington Court House) and Representative Gary Scherer (R-Circleville) are inviting area residents to attend district office hours on Friday, March 8, 2019.